Scratching I would be willing to cede. Somehow I don't think that's what he meant, though. well...if you slowed it down, you would be petting a dog. At that speed..it is scratching the dog. I will try to get video elucidation this weekend. 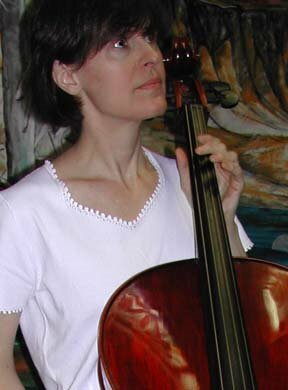 The the right of the cello, and at slower speed it makes sense. What are you using to make your videos? Do you compress them before sending them online? I use the simplest of video setups, recording with an old Canon PowerShot/Elph sitting on a table or music stand at fairly high resolution, then compressing the file in Windows Movie Maker. I import the file, drag it to the timeline, and save the movie using the standard video for broadband setting. Nothing fancy, but the size is usually 1-3MB afterward, easily tolerated by YouTube or Blogger. I do have a lot of light in my practice room (3 lamps, 7 100W bulbs) and that helps with the video quality. Or maybe like the dog's rapidly kicking back leg when she's being scratched. Wow, my teacher used "pet the dog", too, but for a very different technique (for the Bach/Brahms repetitive string crossings). I don't see that as petting the dog, either. Weird.